QuinSolve gratefully acknowledges the kind permission of the Guild School Association and Jarrold & Sons Ltd. Norwich to reproduce the above information on Shakespeare's School. A number of significant buildings can be found in Church Street. The first one is the Guild Chapel of the Holy Cross, a medievial religious foundation, later abolished at the time of the Reformation. Originally founded in the 13th century and rebuilt in the 15th century it has remarkable wall paintings, stained glass windows, a real discovery. Next to the Guild Chapel is the Grammar School founded by the Guild of the Holy Cross, based at the Guild Chapel. This is the school which Shakespeare is said to have attended. The upper floor of the school is the old meeting room of the Stratford town council. 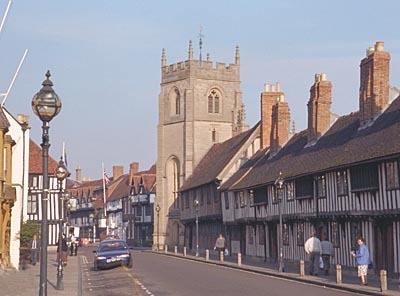 Following directly on from the school are a row of beautiful 16th century timbered almshouses, provided by the Guild of the Holy Cross for the poor of the town.